6,20 € Tax incl. 5,17 € Tax excl. Spray 3D printer plate cleaner. Product packaged in France by the Nanovia company, based in Brittany. 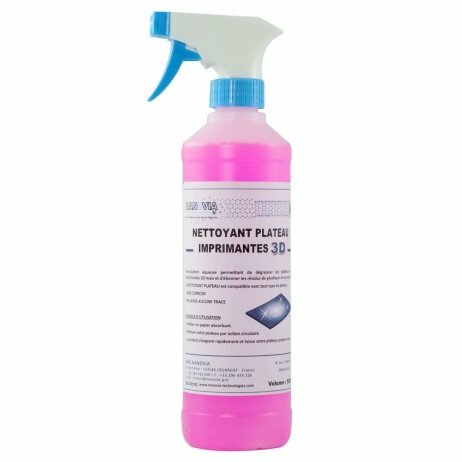 The plate cleaner is an aqueous formulation that easily removes grease from your print surface and helps eliminate plastic films, lacquers and varnishes, adhesive and glue residues. Non-corrosive, this product does not deteriorate or alter the treated surface. It is compatible with all 3D printer materials (glass, resin, composites, aluminium or metals). It is also suitable for most plastics and does not dissolve printed products. The plate cleaner is also an excellent degreasing agent for printed parts before smoothing or painting or after sanding. This product is not considered a hazardous material under the REACH/CLP 2015 regulations. Spray directly on the surface to be treated, wipe with a soft cloth or paper towel. Repeat if required. There’s no need to rinse, the product evaporates quickly on wiping. Do not use on a heated hot plate.